These thermal pads are perfectly suited to equalize height differences and uneven spots on coolers and cooled elements. The very flexible structure and low hardness allow great adaptivity to the cooling surface even at low contact pressures. The thermal pad equalizes the effect of irregularities from microscopic scale to visible scratches etc. The surface of the pad is slightly sticky and is equipped with a protective foil when shipped. This foil must be removed before installation. Now the slight adhesive properties of the pad come into play and prevent slipping of the pad on the cooler or cooled element. Of course these pads can also be cut to the desired size. The pads can be used on VRAM modules on graphics cards as well as on the VRM modules on a Mainboard or almost any other application where a high-performance thermal interface is desired. 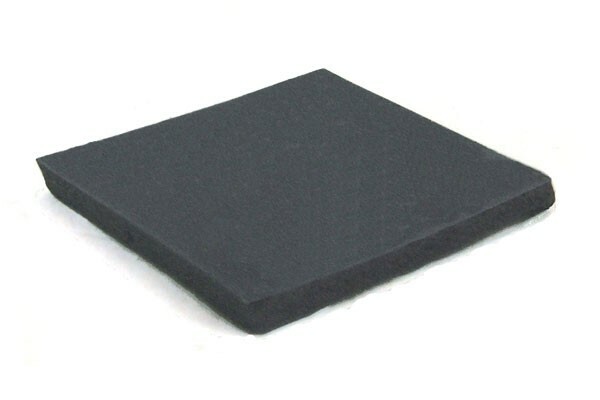 Even elements with large surfaces such as North- or Southbridge on a Mainboard are no problem for this thermal pad as it has great thermal conductivity. As basic equipment and spare parts these thermal pads should be a part of any cooling enthusiast's equipment! Please note: This thermal pad can be compressed to half of its original height!